GEEE Admit Card has released on 09th June 2015 on official website. Now the wait of GEEE Admit Card is over and candidates can download GEEE Admit Card 2015 from direct link given on this page. Galgotias Engineering Entrance Examination (GEEE) will be conducted on 14th June 2015 in the morning shift from 10:00 AM to 11:30 AM. Galgotias Engineering Entrance Examination (GEEE) is going to be conducted at 15 centres i.e. Delhi/NCR, Patna, Lucknow, Varanasi, Kanpur, Dehradun, Ranchi, Agra, Chandigarh, Gorakhpur, Jaipur, Allahabad, Jammu, Bareilly and Meerut. The list of examination centres has proper facility for conducting such exam on time. GEEE will be conducted for 90 minutes. GEEE will be conducted on Pen and Paper Mode. Galgotias University, a private university situated at Greater Noida, Uttar Pradesh had established in 2011 offering admission to various engineering course i.e. B Tech Programmes in Various Disciplines, B Tech and M Tech Programmes and other various Professional Programmes through Galgotias Engineering Entrance Examination (GEEE). This entrance exam will be held on 14th June 2015. The model papers are given on the official website to understand the exam pattern and process to attempt questions in this entrance exam. The qualified candidates will meet counseling schedule for admission on vacant sheet in University and affiliated colleges. Candidates must remind their time of counseling for admission in engineering courses. Galgotia University gives various scholarships for admission in various courses. Earlier Galgotias University offered admission in various engineering program through online application which was available on 23rd December 2014. Those candidates who had completed 12th 10+2 (class XII) or its equivalent securing an aggregate of 50% marks in Mathematics, Physics and Chemistry had applied for GEEE 2015 Exam. The last date for registration was 30th May 2015. A huge numbers of candidates had applied for GEEE 2015 Exam across all over the country. Candidates may apply tips tricks to qualify this entrance test. It is most important to achieve cut off score and become in merit list for getting admission. Time management will be success key to crack GEEE 2015. The best way to download GEEE Admit card is to click on the direct link provided at the top of this page. Candidates enter application number (as given in computer generated online application form) and select date of birth of the candidates. 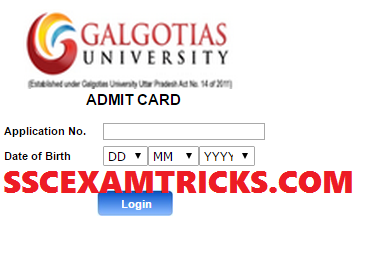 Click on the login button to login candidates account for downloading Admit Card. 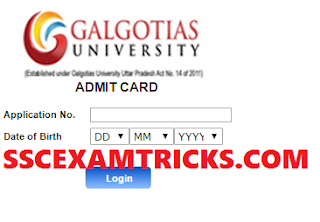 downloaded admit Card in PDF and print the Admit Card Hard Copy for appearing in GEEE 2015. Read all the instructions provided in the GEEE admit card 2015 and ensure the documents required such as ID proof i.e. driving license, PAN card etc. Bring at least one photocopy of ID proof to the venue of exam. Note - Candidates are banned to use of mobile phone/Calculator/Electronic gadgets in GEEE 2015 exam room. · In Pen and paper mode, OMR Sheet Circles given as options will be filled by Blue/ Black ball point pen. It is mandatory for the qualified candidate to verify original document documents in original and two sets of photocopies for counseling. The list of documents required in counseling for admission is given on official website. • Required fee structure in Demand Draft drawn in favour of “Galgotias University, Uttar Pradesh” payable at Delhi / Noida / Greater Noida. Please write your name, Course and Application ID behind the DD.